The second major Comcast service outage this month left thousands of Comcast customers without service across the country. Many people took to Twitter to ask if Comcast had tried turning off the internet and turning it back on again. One report said that two major fiber lines had been cut. There are some on Twitter who were wondering if possibly a mouse had chewed the fiber-optic cable that caused the problem. Comcast is currently engaged in a battle with Disney Studios over Fox Studios which it looks like they will lose. Comcast said they were aware of the problem and were working on it. There were reports that 1-800-COMCAST, the number to use to report problems was not in service. 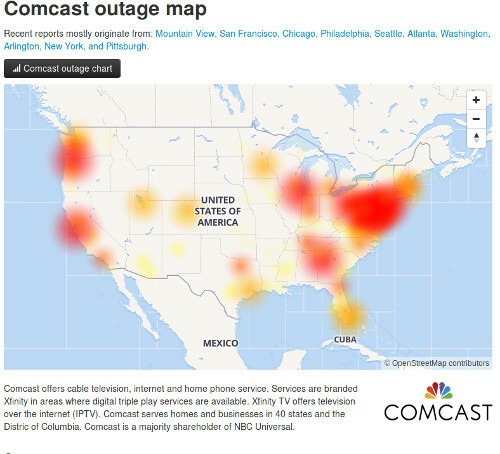 From this downdetector.com map, it looks like Comcast was down in most of their service area. The problem seemed to affect other seemingly disrelated services as well with Playstation online services as well as Microsoft's Xbox online services.